Most national moving companies charge a minimum weight-based rate, typically 1,600 to 2,000 pounds. This 1,300-pound small move is a 2-pallet shipment of household goods — small pieces of furniture, books, knickknacks, framed artwork, clothing. The photo actually contains two separate shipments. 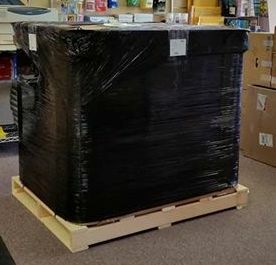 The two pallets on the left are the small move; the smaller pallet on the right contains an over-sized “Santa” chair from a local gallery. Are you planning a small move from Colorado Springs? Get a quote from Pak Mail. What do these projects have in common? Camping. One is a van conversion kit from Wayfarer Vans; the other is family camping gear for a small move. Enjoy your summer! The college semester is almost over. Time to ship all your stuff home and get ready for finals. Student shipping from Colorado College or UCCS – home for summer break, to a new college for extended classes, or abroad for intensive studies – is easy with the right help. It’s a small move of the accumulated stuff after a year in a dorm room or small apartment. Make the necessary shipping arrangements before final exams and clear the plate for studying, final projects, and, of course, socializing. Start the process by organizing. Ask some questions. What can be recycled? 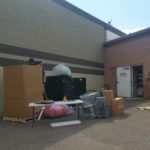 Organizations like Discover Goodwill of Southern and Western Colorado thrive on donations of gently used clothing, household goods, furniture, and electronics. Old cell phones can be donated to Cell Phones for Soldiers. What can be sold? Textbooks can be sold for cash at Pak Mail. What can be discarded? Get rid of the items that are no longer useful and cannot be donated or re-purposed. What is absolutely needed for the final few weeks at school? This is anything that can be safely packed in a suitcase. Everything else can be shipped ahead. Pak Mail can also pick up, pack, and store all of the non-essential items, and ship them when the final boxes are ready. What items require special packing? It’s a definite no-no to pack electronics in the middle of clothing. Leave those items for the professionals. 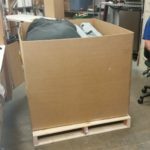 There are several ways to ship a student… their stuff, that is. If there are three or four boxes, UPS or FedEx (DHL for international) is probably the best option. 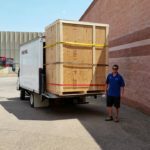 If there are more boxes and a myriad of sports equipment, shipping them all together on a pallet with an LTL truck carrier is more cost effective. US Air Force Academy foot lockers are best shipped on a pallet. Get an estimate, arrange for pickup and shipping, and get on with studying. Last year provided quite a ride and lots of reasons to be grateful. 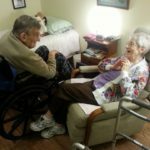 My four siblings and I transitioned our elderly parents from their home to assisted living. Both Mom and Dad are still enjoying each other’s company after 64 years of marriage. Senior downsizing done with love. The box truck we acquired in Spring 2015 blew its engine within the first month. Our mechanic replaced the engine and had it running like new in no time. The lift gate makes the large freight jobs easy! New paint and furnishings freshened up the retail area of our store. Customers provide lots of fun comments and kudos. Our Pak Mail franchise is now part of a larger franchise — Annex Brands. Pak Mail 232 has been in the same location since 1996! We will celebrate nine years of ownership at the end of February 2017. Thank you to our customers! Some customers have been with us “forever,” some joined us recently, and some are yet to require our services. Whether it’s a private mailbox and a safe place to receive packages, notary services, a small gift shipping to Aunt Millie, documents shipping overnight, a custom box with protective packaging, or a large shipment requiring a pallet, rely on Pak Mail. Pak Mail offers shipping with FedEx, UPS, DHL, USPS postal, and large freight carriers. Lift gate is used for large freight and estate pickups. 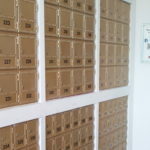 Pak Mail private mailbox offers safe and secure package receiving. A small move shipment ready for pickup by freight carrier. Summer solstice has come… and gone. July 4th is here. Longer days encourage cleaning up the house and removing clutter. Downsizing seniors decide to become full-time RV travelers. High school graduates prepare for college. All of these activities could require small move shipping. One of our older-in-years customers recently told us his long-distance grown kids told him they would someday like to have this or that – a family heirloom, furniture, china, artwork, photos. He decided it’s time to downsize. Instead of keeping those cherished pieces, he now enjoys gifting them to his children. He recently requested we pick up a leather chair and ottoman to ship to his son. 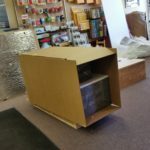 The furniture is now in the store awaiting pickup from our small move blanket wrap carrier. My folks, now 88 and 91, have been downsizing for years. Mom insisted we five siblings, and the grand-kids, put our names on the back of things we would someday like to have. Some of the treasures have already been shipped to us. Many are still in the house for Mom and Dad to enjoy. Mom’s lessons hit home when we decided to move into our fifth-wheel trailer in preparation for future full-time travel. The only thing left to downsize is the little bit in our storage unit. Gifting and shipping family treasures at your leisure is a little different from distributing an estate after the passing of a loved one. But, estate distribution does not have to be full of hassles. Senior move managers, and packing and shipping companies like Pak Mail can help. The deadline for picking up items from the home falls on the shipping company’s shoulders. The actual packing and small move shipping is then completed to meet the recipients’ schedules. In May, Pak Mail ships students… their stuff, that is… home from UCCS and Colorado College. In July, students, and their parents, decide what to take to college. If the school is out of state, shipping may be part of the process. The preparations can happen at your leisure, up to a point. Assuming the college semester begins in mid to late August, decisions about what to take should be finalized before the end of July. If shipping is required, items must be ready for pickup by Pak Mail no later than the first week in August. The delivery deadline for the student’s stuff is communicated at that point. The items are then packed and shipped to arrive by that deadline. Small move shipping at your leisure or to meet a deadline, call the experts. A breakfast networking meeting with folks from the Manitou Springs Chamber of Commerce was the beginning of a delightful day. Upon my return home, my husband Jim invited me to stay home for the day. Perfect! First on the agenda was clearing my mind. A brisk two-mile walk and then fiber spinning did the trick. Spinning tends to empty my mind of clutter and focus it on a specific task. Today the rhythm of the wheel and the creation of yarn from fluff – llama, wool, and mohair – pushed me to look around at the collections acquired throughout a 40-plus-year-and-counting marriage. 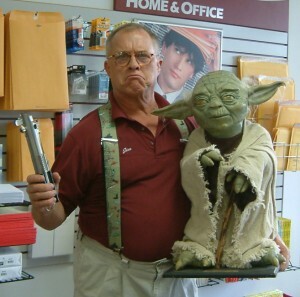 Then I started thinking about some of the treasures we ship for our customers – assortments of sentimental photos, stamps, coins, antique dolls, porcelain figurines, and a high-value Star Wars® prop. This reverie brought to mind packing and shipping collectibles in our Pak Mail store. Books, photos, letters, and other non-fragile items may only need protection with acid-proof paper or simple poly bags. Kachina dolls are packed with lots of packing peanuts and then double boxed. Lladro® or Hummel® figurines and pottery are wrapped in bubble wrap, floated in peanuts, and boxed or double boxed, depending on the value and/or sentimentality. Intricate and very fragile porcelain pieces are floated in mini-peanuts surrounded with bubble wrap and then floated in standard packing peanuts and double boxed. High-value collectibles like Yoda are secured in custom crates. 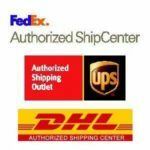 The shipping method is based on package size and weight, fragility of the item, total number of boxes, value, and destination. Smaller items ship with UPS, FedEx, US Priority Mail, or DHL (international only). 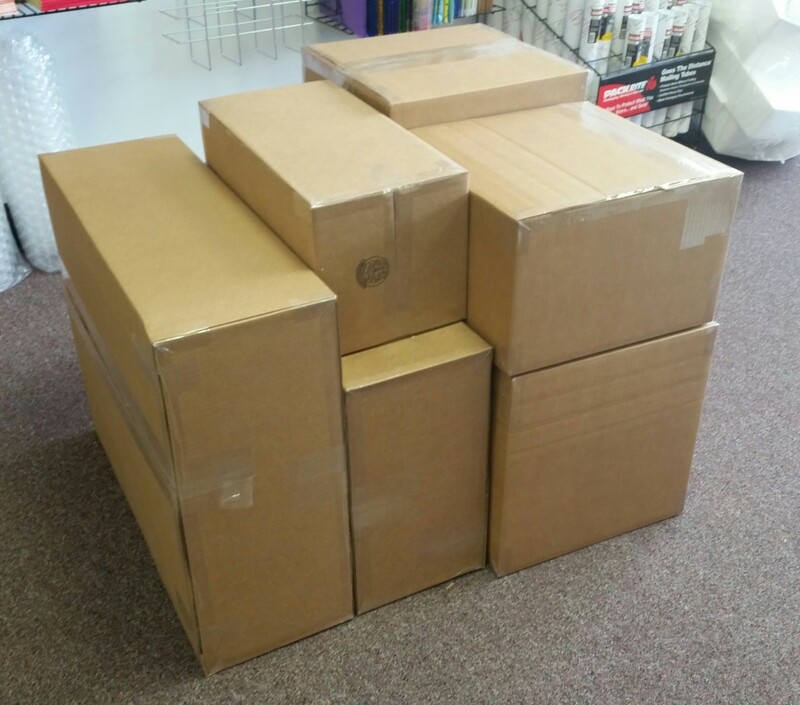 Larger items or larger quantities of boxes ship with various freight carriers. The small move of household goods that included Yoda was shipped to Hawaii via ocean freight. It was nice to have a day to reflect and create, and see how it all ties together. See you in the store. How Do You Move a Student? This is not about “motivating” a student. That’s a separate topic. This is about how to move a student from Colorado College or UCCS home for summer break, a new college for extended classes, or abroad for intensive studies. It’s about shipping the accumulated stuff after a year in a dorm room or small apartment – a small move. Students have a full plate at the end of a semester, particularly at the end of the school year. Making the necessary shipping arrangements to move a student before final exams checks one thing off the list and clears the plate for studying, final projects, and, of course, socializing. Start the process by organizing. Ask some questions. What can be sold? Books can be sold on Amazon or on campus. Savvy students sell electronics and other items online. 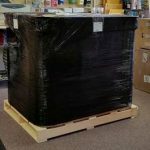 Get a shipping estimate for larger items before posting them for sale. What can be discarded? Get rid of the items that have outlived their usefulness and cannot be donated or repurposed. What Is a Small Move Estimate? 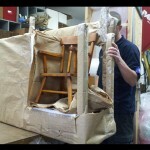 Packaging requirements: How many pieces of furniture? 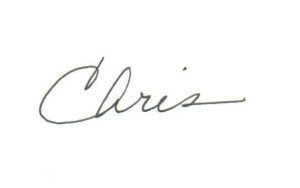 How many fragile items (china, glassware, artwork)? How many non-fragile items? Weight: What is the approximate weight of each item? Smaller items can be weighed on a bathroom scale. 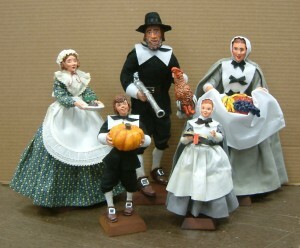 Larger items can be estimated from catalogs of similar items. Size: What are the measurements (length, width, height) of the larger items? How many boxes are pre-packed and what are their sizes? Value: What is the total value of the shipment? Are there any high-value items like artwork, silver, or antiques? Destination: What is the destination – city, state, country, and postal code? Is it a residence or a business? Are there multiple destinations? Timing: When does the shipment need to arrive? Pak provides free small move estimates – by phone, in person, or online. How Are Fragile Items Packed for a Small Move? Packing fragile items for small move freight carriers, as well as for UPS, FedEx, and DHL, is different from packing for moving companies. Moving companies typically pick up household items at one location and drive them to the destination without any unloading or reloading along the way. 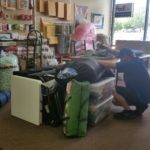 The recommended packing for moving fragile items is well documented by various moving companies like United Van Lines and Two Men And A Truck. This method incorporates sturdy corrugated boxes, packing tape, and lots of packing paper. 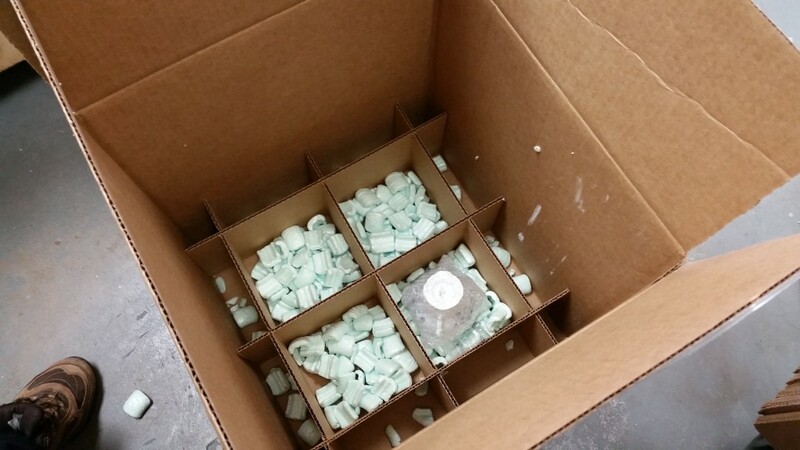 Items are individually wrapped in the paper and cushioned tightly in the box with additional wadded up paper. Standards for packing fragile items for small move shipping are set by the carriers and by declared value insurance companies. The shipped boxes are loaded and unloaded multiple times and may be stacked at the carrier facilities. 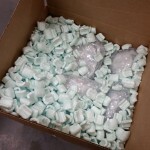 The packaging standards include a minimum of two inches of cushioning – bubble wrap and packing peanuts or Styrofoam, not paper – around all of the fragile item’s dimensions. For example, a fragile glass bowl measuring 8”x 8”x8” would require, at a minimum, a 12”x12”x12” box. If the item is valued under $200 and is easily replaced, that box with appropriate cushioning is sufficient. If the item is valued over $200 or is one of a kind and/or sentimental and not replaceable, it would be double-boxed in a 12”x12”x12” inner box and a 16”x16”x16” outer box, each with two inches of appropriate cushioning. In the unlikely event of a damage claim with a shipping carrier, the outer box is examined for visible damage. If there is no damage to the outside of the box, the carrier representatives will examine the inner packaging to ensure standards have been met. Pak Mail packs all small move fragile items securely for safe delivery. 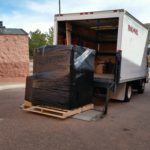 Pak Mail Colorado Springs is a full service shipping store located in Colorado Springs that specilaizes in custom packing, custom crating, and specialty freight shipping. Request a Free Online Estimate or call us at 719-593-1212.